Teaser ad appearing a week before the release of the film The Idol Dancer (1920). A teaser campaign, also known as a pre-launch campaign, is an advertising campaign which typically consists of a series of small, cryptic, challenging advertisements that anticipate a larger, full-blown campaign for a product launch or otherwise important event. These advertisements are called "teasers" or "teaser ads". A teaser trailer for an upcoming film, television program, video game or similar, is usually released long in advance of the product, so as to "tease" the audience. An early example of the teaser trailer was the one for the 1978 Superman film by Richard Donner. The film was already nearly a year late; it was designed to re-invigorate interest in the release. Teaser campaigns, or teaser advertising, can be defined as a planned set of communication activities designed to arouse interest without giving too much away (Trehan and Maan, 2012). Often, it is not a single advertisement but a series of inter-related communications, combining multiple forms of advertising, surrounding a single theme or idea that consumers follow to fill in the information and lead up to the "reveal" (Menon and Soman, 2002). Teaser campaigns are used over traditional advertising technique by brands and companies who wish to launch new products into the relevant market, often before the product is finalized in production in order to create a buzz (the degree of attention a brand gains in the market) and gain headway before the product is released. By doing this, brands can gain knowledge on how consumers are responding to aspects of the product before it is finalized and make changes if needed (Trehan and Maan, 2012). Studies have found that advertisements that immediately introduce the brand name have less of an association building effect between the brand and product category, than advertisements that evoke mystery and only reveal brand names once the viewer is hooked (Fazio, Herr and Powell, 1992). Teasers can also be used to draw attention to a unique element of a brand rather than separate it completely from the market and inform consumers about a differentiated selling proposition. Brands that already have a position in the market can use teaser campaigns to create new brand imagery especially if they have gone through managerial changes, rebranding or decided to target a new market due to attention from an unexplored segment. Teaser campaigns allow brands to introduce themselves in a controlled and desired way in an attempt to possibly change the publics current perception of the brand. Teaser campaigns from known brands give space for both the advertiser and the consumer to feel out the market before rebranding. When companies decided to present a product to the market again in a different light, teasers can be successful in rebranding and creating fresh excitement for their products and services (Trehan and Maan, 2012). Teaser campaigns are the ultimate creative advertising strategy which bodes well if a brand wants to be perceived as innovative, original or imaginative. Through inter-related advertising content, the brand has the chance to reveal to the consumer small parts of the final message at its own pace. Often, the messages the audience are receiving are so imaginative, that they create interest but don’t get figured out easily. A good example of this was internet campaign "Got Milk". In the US, viral messages about how cow abductions were said to be increasing were being shared around and as people speculated and theorized as to why this way happening, the campaign revealed the punch line; aliens were stealing the cows as they knew the benefits of drinking milk! This served as a sort of public service announcement to increase nutritional awareness and boost the milk industry (Trehan and Maan, 2012). Teaser campaigns increase business to consumer interaction through dialogue. The advertisements start discussions between consumers, media outlets and on social media. A successful teaser ad initiates interpersonal communication between friends, group communication in workplaces and social situations and in the virtual world such as on Facebook, Instagram and YouTube. Campaigns can all have different objectives whether it be to entice consumers to seek out more information and reward them with the gratification of figuring out the punch line, or business’ communicating with customers by delivering small tidbits of information and allowing them to respond (Trehan and Maan, 2012). Teaser campaigns are a good way to create a business to consumer bond by forcing the audience to follow the campaigns journey in order to piece together the message. Because these advertisements are based on curiosity in order to promote a product, the audience looks forward and seeks out the next piece of the puzzle which forms an attraction to that brand over again due to the repeated messages delivered through the teaser campaign (Trehan and Maan, 2012). 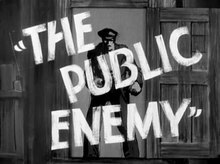 Teaser trailer for The Public Enemy, showing no actual footage of the film. Film teasers are usually made for big-budget and popularly themed movies. Their purpose is less to tell the audience about a movie's content than simply to let them know that the movie is coming up in the near future, and to add to the hype of the upcoming release. Teaser trailers are often made while the film is still in production or being edited and as a result they may feature scenes or alternate versions of scenes that are not in the finished film. Often they contain no dialogue and some (notably Pixar films) have scenes made for use in the trailer only. Teaser trailers today are increasingly focused on internet downloading and the fan convention circuit. Some teaser trailers show a quick montage of scenes from the film. The teaser for the 1989 Batman film starring Michael Keaton was an emergency marketing move that successfully convinced angered comic book fans that the film would respect the source material. Later examples of major motion picture events that used teaser trailers to gain hype are The Lord of the Rings trilogy, the Star Wars prequels, and the Spider-Man films. The Da Vinci Code teaser trailer was released even before a single frame of the movie had been shot. Harry Potter and the Half-Blood Prince's teaser trailer was released surprisingly late, but when it was pushed back from November 21, 2008 to July 17, 2009, the trailer was surprisingly early. A teaser for Star Wars: Episode I – The Phantom Menace was attached to the films The Siege and A Bug's Life, and it was reported that many people had paid for admission to the film just to watch the trailer, and had walked out after the trailer had been screened. Similarly, teasers for Star Wars: Episode II – Attack of the Clones and Star Wars: Episode III – Revenge of the Sith were shown before the Pixar films Monsters, Inc. and The Incredibles, respectively. The teaser trailer for Cloverfield was first publicly shown attached to the film Transformers; at that point, nothing about the former was known, and the one-and-a-half-minute teaser did not include the movie title; only the producer's name, J. J. Abrams, and a release date, 1.18.08, were shown. The teaser trailer for another film directed by Abrams, Star Trek, was attached to Cloverfield itself, depicting the starship USS Enterprise being constructed on Earth, and again showing no title, instead just showing the Starfleet Insignia. The Star Trek teaser trailer originally announced the release date as Christmas 2008, but the movie was eventually delayed to May 8, 2009, making the wait between the teaser trailer and the movie itself 16 months. Some other teasers do not explicitly display the film's title, but reveal it in the URL for the website. Teaser often create hype in media to such extent that they get leaked. Avengers: Infinity War and 2.0 prove to be such examples. The teaser (the director's version) of "2.0" was released weeks before it was officially released on YouTube. DVD and Blu-ray releases of movies will usually contain both their teaser and theatrical trailers as special features. One of the most notable exceptions to this rule is Spider-Man, whose teaser trailer featured an unrelated plot of bank robbers escaping in a helicopter, getting caught from behind and propelled backward into what at first appears to be a net, then is shown to be a gigantic spider web spun between the two towers at the World Trade Center. This teaser was pulled from theaters following the September 11 attacks, but it can be viewed on YouTube. ^ Reuters (November 20, 1998). "Star Wars trailer gets sneak preview". CNN. Retrieved 12 September 2010.